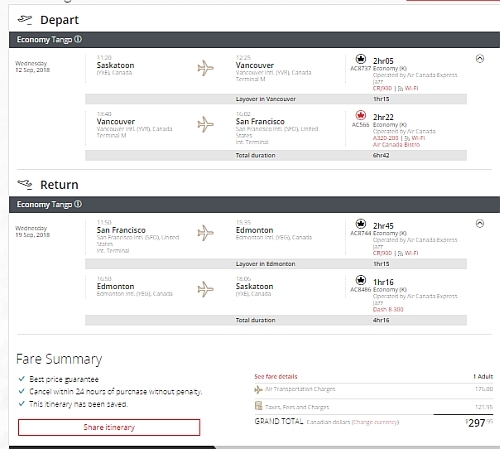 Air Canada has dropped the price of their flights from Saskatoon to San Francisco, California down to $289 CAD roundtrip including taxes. 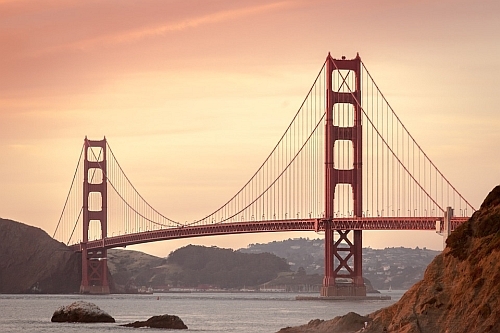 This is 35% below the typical best roundtrip prices from Saskatoon to San Francisco. - look for the dates that are $298 roundtrip. On Priceline, the price will show up as $229 USD. Priceline is *always* in $USD. This will work out to $289 CAD roundtrip when booked with a Canadian credit card, and factoring in the typical credit card foreign exchange fee. saskatoon, yxe, flight deals, air canada, united states, north america, san francisco and sfo. 2 Responses to "Saskatoon to San Francisco, California - $289 CAD roundtrip including taxes"
So why would you goto priceline instead of directly to the airlines website? any advanyage? Pay in Canadian dollars and avoid foreign exchange fees by booking direct. It's slightly cheaper through Priceline, even factoring in the foreign exchange fees. .